Local materials and plants hold up best under the harsh conditions of the desert. The benefits of using native plants and local materials are many. 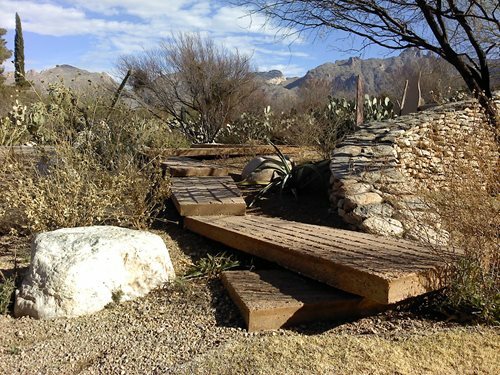 Native plants not only reflect the character of the desert surroundings, but they are also better adapted to survive the hot, dry conditions than are most ornamental plants. However, not all native plants are created equal. A locally-grown native will already be suited to the conditions in which it will grow, while the exact same variety of native plant grown in California, for example, may have acclimated to a cushier lifestyle. Rock or pea gravel make an ideal mulch for dry-loving desert plants. 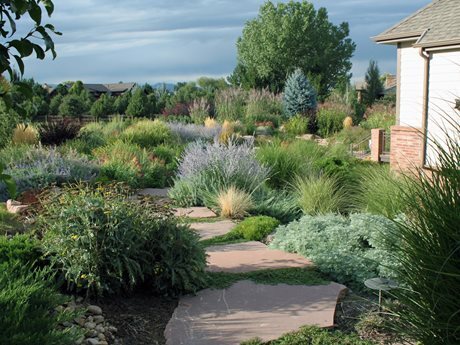 While traditional garden plants enjoy the added moisture from an organic or wood-based mulch, Mike Woods of J&S Landscape in Longmont, CO points out that many Colorado natives will rot when faced with a moist soil surface. "We'll use a finer stone mulch such as pea gravel in areas with very xeric plants," says Woods. This garden is mulched with a local gravel made of super-heated shale. 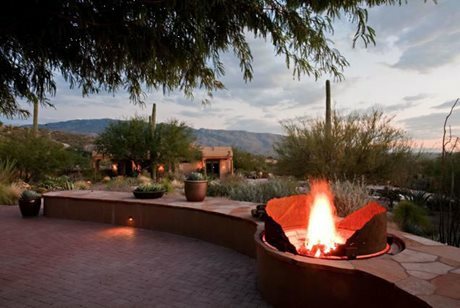 Fire pits are a design accent you can enjoy after the heat of the day has died down. 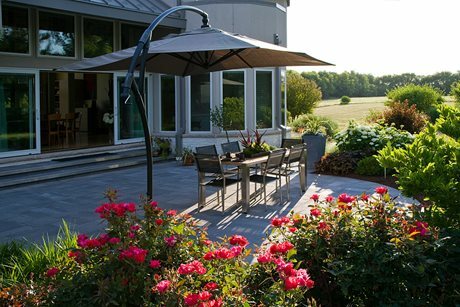 This extended patio has ample banco (built-in bench) seating for guests to gather around the fire pit and enjoy conversation. "In the Southwest we get high winds, so I designed a fire pit with a revolving screen on wheels so you can move it according to the direction the wind is blowing," says Elizabeth Przygoda-Montgomery of Boxhill Landscape Design in Tucson, AZ. Pros recommend using drip irrigation for nearly any kind of planting. 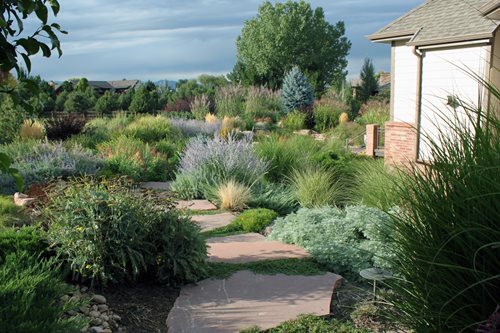 Even though many native desert plants dislike regular watering once they are established, an irrigation system is still a good idea for those tough first seasons when your tiny plants are struggling to grow to their full potential. "We irrigate everything," says Woods. "All our plantings have either conventional "point source" drip emitters, or in some cases we use a product called Netafim which is an irrigation system laid out in a grid." In order to deal with varying plant needs, Woods comes back during the second full season of growth to maintain the irrigation system and plug emitters as needed. This ensures the system is only watering those plants which truly need and appreciate it. 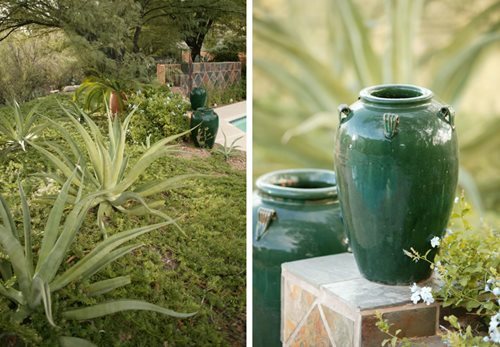 Waterwise design is about more than just plant selection. 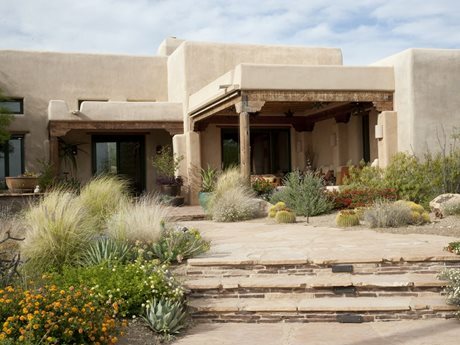 There are a number of elements to consider when designing a low-water landscape in the desert. First, plan to grade the soil so water moves towards the plants, rather than washing away. Next, make sure to group plants with similar water needs on the same irrigation zone to make the most of every bit of water you provide. Lastly, consider which plants can benefit from one another's water supply. "In the desert I do a lot of combinations where plants can mooch off each other's water source," says Przygoda-Montgomery. "If you plant a new tree, it will need to have drip emitters for water, and that's a great opportunity to do some under-tree plantings without having to provide them with any supplemental water at all - they can borrow water from the tree. Go bold with planting contrasts and design accents. 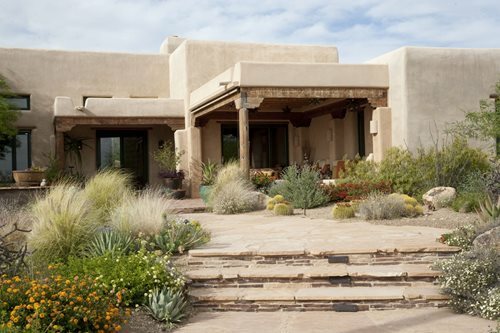 Xeriscaping needn't be ZERO-scaping. "By mixing sculptural plants and soft plants, you can add layers and interest to the landscape," says Przygoda-Montgomery. Here, the contrast of spiky octopus agave with lush, low-growing Myoporum brings a sense of artistic tension and drama to this planting area. Pottery can also make an effective accent. 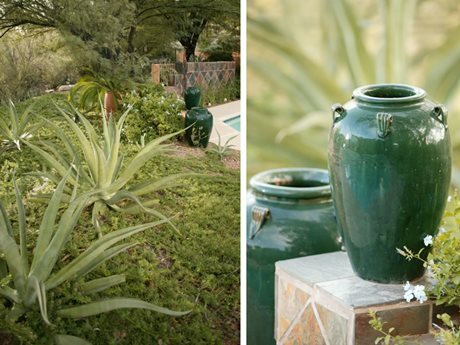 These reflective green vase-shaped pots look verdant and cooling in the desert setting. In any style of landscape design, a connection with the seasons is key. 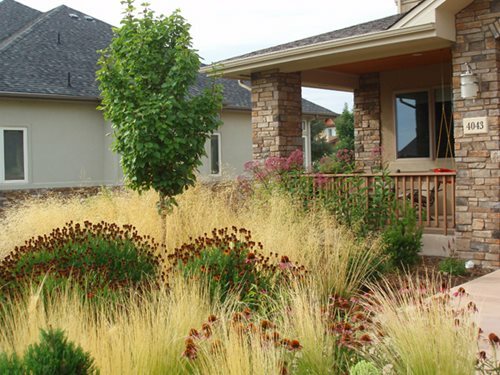 This autumn landscape makes stunning use of textural contrast, foliage colors, fall bloomers, and plants with seed heads that linger attractively through the end of the season. Fall-blooming ornamental grasses rustle and sway in the breeze, while the hazy purple tones of Russian sage and catmint bring calming touches of color. Along the path, the flower heads of yarrow add a more sober touch of interest now they've turned brown. "The grasses are spectacular in this garden, along with the variety of Agastaches (hyssop)," says Woods. "It's a cool place to take pictures of backlit seed heads."